Kevin Dugan writes me to share this tounge-in-cheek post of how sick he is of hearing about Twitter. I totally understand where he's coming from. Twitter goes against the very valid grain that we are already too connected and we don't need more of it. Especially the seemingly insignificant notion of sharing random thoughts about "what you are doing" at this very moment—("I'm writing a post about Twitter"). If you are interested about marketing, conversations and the ways which we communicate with each other (and how this is changing and evolving), you should at least investigate what the hoopla is all about. My recent experiences with Twitter tell me that the service is morphing due to how users want to use it. What was once initially designed to answer the question "what are you doing? ", has turned into a free-form communications service where people are having burts of shorthand conversations, sharing links and information in rapid-fire fashion. The case study I offer for this is the SXSW conference which is currently wrapping up. I observed (and to some extent participated) in some of the back and forth communications and even got some gems out of it like this link to Kathy Sierra's keynote. I've also been reminded via someone's Twitter about daylight savings which I've made a tradition out of missing every year (except for this one). And here, Leisa shares how she would have missed her flight to SXSW if it were not for Twitter. Applications and hacks are coming out of the woodwork like the mobile version called Twapper as well as a application which puts you in touch with people who are using the service and are in close proximity to you locally. 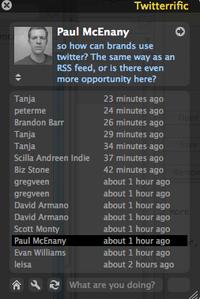 Twitterrific (now available for Mac) let's you send and recieve "Tweets" ala a very slick chat-like app (shown here). So, should you stop what your doing and jump on the bandwagon? NO. It's not for everyone. And I don't recommend it for people who are already trying to cut down on their Internet addictions. But, if you have a vested interest in this space, you should be following the movement and coming to your own conclusions. Personally, I think Twitter is a pretty powerful tool for anything involving promotions, events and communities. I've seen it in action first-hand used this context and with the exception of some tech outages due to the surging popularity—it's pretty darn effective. PS, for the record I'm Twittering irregularly—a handful a day (5 or so on average) and I don't see it as a blog replacement—again the potential to exchange information rapidly while away from your computer is one of the most significant factors that has fueled Twitter's most recent explosion.